It’s worse than that. The entire Brexit fiasco has sunk our democracy, leading the country to disaster. 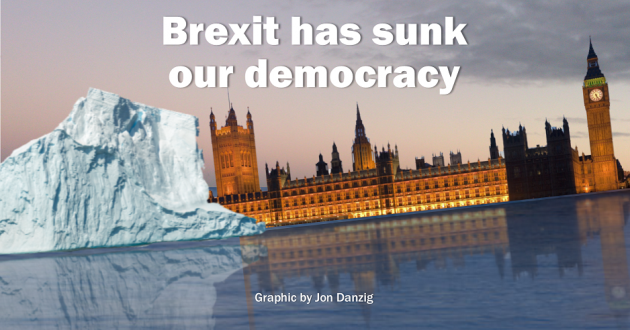 Yes, Brexit is the iceberg, our Parliament is the Titanic, and we are heading for one almighty crash. There is no band playing, there is no re-arranging of the deckchairs. 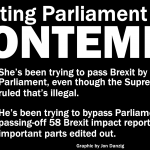 Instead, at the very last minute, MPs have been discussing amendment after amendment, voting on the same déjà vu deal over and again, and traipsing in and out of lobbies, whilst an imminent and crushing Brexit impact is just days away. The country is now close to a state of emergency, with a government minister admitting that he’s the world’s biggest buyer of fridges, so that vital medicines can be stockpiled as they will be in short supply if we default to a ‘no deal’ Brexit. Businesses across the country are in a state of panic and distress as the government has suddenly announced new tariffs that will be applied to exports and imports if ‘no deal’ happens. Dover and other Channel ports are bracing themselves for months of disruption if we leave without a deal. And really, all that is just the tip of the iceberg. How on earth did the country spend three tiresome years navigating itself to this? And is there now any quick and easy emergency escape from the chaos that now confronts us? The answer to the first question is complicated, but in a nutshell, the journey to where we are now started off as being entirely undemocratic. If democratic principles and safeguards had been applied from the start, we would not now be in such a calamitous situation. And the answer to the second question is yes, there is a quick and easy way out of this. (But you’ll have to read on to find out what it is). 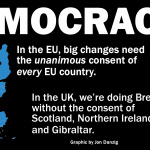 The assault on our democracy began when, in 2015, Parliament approved a referendum on EU membership which, because it was advisory only, did not have the same checks and balances of a legally binding vote. 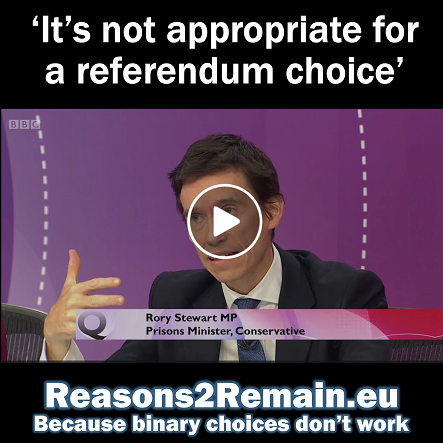 Then the government responded to the referendum result as if it was a legally binding decision, but at the same time, not allowing our Parliament the usual scrutiny and oversight that should have followed an advisory-only referendum. 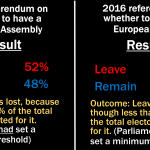 If the referendum had been legally binding, then Parliament would have set a minimum threshold for Leave winning – just as Parliament did for the 1979 referendum on whether Scotland should have its own assembly. On that occasion, ‘Yes’ won 52% to 48% – just like the EU referendum. But ‘Yes’ didn’t win, because Parliament had set a minimum threshold of 40% of the electorate having to vote for an assembly before Scotland could have one. Less than 40% of the Scottish electorate voted for an assembly, so on that occasion the ‘Yes’ vote failed. Only 37% of the electorate voted for Leave in the EU referendum. So, if the same rules had applied as the 1979 referendum, Leave would not have won. In any event, Leave should not have won with only 37% of the electorate voting for it. Most democratic countries across the world that have referendums would not allow such a minority vote to win such a major referendum. Indeed, even your local golf club would not allow 37% of its members to change their constitution. We now know that the Leave campaigns only won – by the slimmest of margins – because of lying, cheating and law breaking. They overspent what’s allowed under electoral law by a significant margin. Masses of stolen personal data were used to target potential voters in illegal ways. The Electoral Commission is suspicious that millions of pounds given to the Leave.eu campaign originated from a foreign source – which would be illegal. There are now several ongoing criminal investigations into Leave campaigns and campaigners (none against Remain). If the referendum had been a legally binding vote, then under UK law, such illegalities and irregularities of such magnitude would have resulted in the referendum result being annulled by the courts. But as the referendum was an advisory exercise only, it escaped such legal scrutiny – even though the referendum result was treated as if it was legally binding. The courts cannot annul an advisory vote in the same way that a legally-binding vote can be annulled when serious irregularities may have affected the result. It could all have been so different. Following the referendum, the new Prime Minister, Theresa May, could have appointed a Royal Commission to explore and decide which form of Brexit was viable and then asked Parliament if it wanted to do that Brexit. Instead, Mrs May was in a hurry to trigger the Article 50 notice by bypassing Parliament, using the ancient and arcane ‘Royal Prerogative’. Gina Miller’s legal challenge stopped that. The Supreme Court confirmed that the referendum was only an advisory exercise and that the decision to leave the EU had to be taken by Parliament. 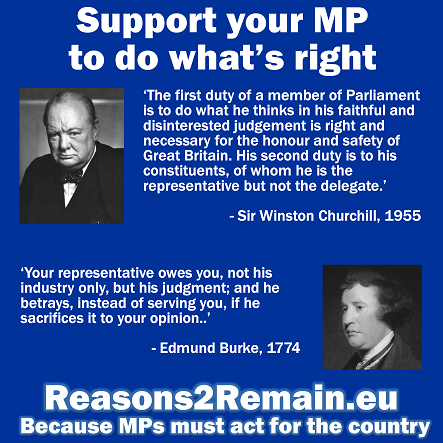 However, Parliament wasn’t given an opportunity to decide whether the UK should leave the EU. The then Brexit Secretary, David Davis, erroneously advised Parliament that such a Parliamentary decision wasn’t necessary, as ‘the decision’ to leave had already been taken by the referendum. A ‘decision’ that the Supreme Court had already ruled that the referendum wasn’t capable of making. Mr Davis told Parliament that, since the ‘decision’ to leave the EU was already made, all that Parliament was required to do was to give the Prime Minister authority to notify the EU of an ‘intention’ to leave. Parliament was presented with one of the shortest bills ever, ‘The European Union (Notification of Withdrawal) Bill’. When Parliament passed this Act to give power to Theresa May to notify the EU of a decision that had yet to be made, the world was led to believe that Parliament had voted to leave the EU. Nothing of the sort had happened. Parliament has never actually debated and voted on the specific question of whether the UK should leave the EU. So, since the referendum couldn’t make a decision to leave the EU, and Parliament didn’t make the decision, who did? That mystery was unravelled in June last year, at a ‘permission hearing’ in the High Court regarding the validity of Article 50. That hearing established that the Prime Minister, Theresa May, exclusively and individually made the executive decision for the UK to leave the EU. Lord Justice Gross and Mr Justice Green unusually made their judgment citable and ruled that the decision to leave the EU was contained in the Prime Minister’s Article 50 notification letter of 29 March 2017, to Donald Tusk, President of the European Council. In that letter, the Prime Minister stated that ‘the people of the United Kingdom’ had made ‘the decision’ to leave the EU, even though the Supreme Court had ruled that the referendum was advisory only and not legally entitled or capable of making any decision. She then erroneously advised Mr Tusk that ‘the decision’ to leave the EU had been ‘confirmed’ by the United Kingdom Parliament. Parliament had only given the Prime Minister permission to give notice to the EU of an ‘intention’ to withdraw from the EU. That’s not at all the same as a specific decision to leave. Had Parliament been asked following the advisory referendum to debate and specifically vote on whether the UK should leave the EU, a bill to this effect would have required a plan, impact assessments and evidence from all the Brexit committees. Parliament has recently been asked twice if it wants to leave the EU on the terms negotiated by the Prime Minister. The House of Commons has twice voted NO with historic majorities. Parliament is deadlocked because the executive tricked us all by asking Parliament the wrong question following the referendum. Asking Parliament instead if it will give permission for the Prime Minister to notify the EU of an ‘intention’ to leave is not at all the same as a debate and vote on whether we should remain or leave. Now, Parliament is alarmed that we are just days from crashing out of the EU without any deal, which almost all politicians – and businesses – agree will cause chaos. At the last minute, this week Parliament voted by a large majority that the UK must not leave the EU without a deal. But the Dutch Prime Minister, who compared that to, “the Titanic voting for the iceberg to get out of the way,” was depressingly right. Parliament has no power to stop the UK leaving without a deal. Our Parliamentarians have been led into a cul-de-sac by a cunning government, which has acted dictatorially rather than democratically, and in their own narrow interests, rather than that of the country. The only way to avoid a ‘no deal’ exit is for Parliament to either ratify Theresa May’s deal, or revoke Article 50. Extending Article 50 will merely push back the impact of the iceberg, and doesn’t take away the potential danger. (Although a delay would give time for a new referendum on Brexit, so ‘the people’ could decide whether they accept ‘the only deal on the table’ or to remain in the EU after all. However, so far, Parliament has voted against having another referendum). So, what’s the easy way out of Brexit that was promised at the start of this article? Since it’s been demonstrated in the High Court that it was the Prime Minister alone who made ‘the decision’ to leave the EU, she also has the power to undo what she has done. The most sensible and honourable course for the Prime Minister to take now would be to revoke her Article 50 notice and order a Brexit Inquiry. She can do this entirely on her own without any statute or Parliamentary approval. of such breath-taking proportions, that had the referendum been a legally binding vote, it would have been annulled. Yes, Brexit is a titanic sham. • Thanks to Liz Webster for her assistance on this article. This entry was posted in Current Affairs, Democracy & Citizenship, Politics & Public Policy, The EU and tagged Article 50, brexit, David Davis, democracy, EU Withdrawal Bill, European Union, Gina Miller, Theresa May, Titanic. Bookmark the permalink.